A high standard of fully serviced modern offices within a brand new development in Birstall. Complete with free parking and a fully manned reception area. Superb road links, with the M1, M62 and M606 guaranteeing easy access to the surrounding region. 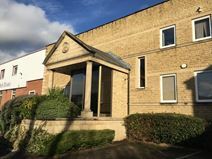 Situated on a popular business development, close to the M62 and M621 providing quick access to central Leeds and Bradford, this property provides attractive office space across three floors. Layouts are flexible, fittings are high-quality, and there is ample car parking.